Mr. Burrito is turning 4 years old this coming weekend, so my Nostalgia for this week is his previous birthday celebrations. His first birthday was celebrated at our humble abode just a couple of weeks before we went to Korea. His second birthday was when we were in Korea but we decided to celebrate it when we had our very first vacation in the Philippines. 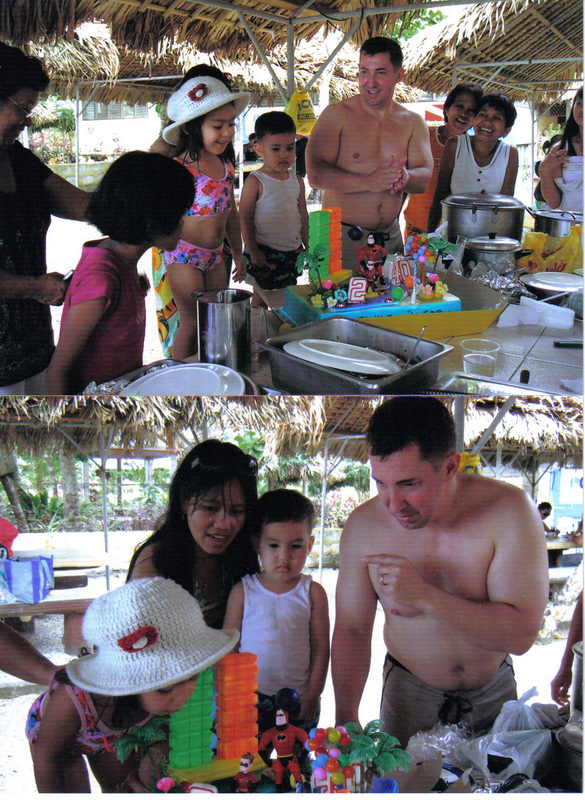 Him and his dad celebrated their birthdays at a local resort in Donsol, my town, the place where whalesharks are famous. We went swimming with the butanding or whaleshark. His thrid celebration was when we came back here in the States. It was the first time that the Worthington family visited our home. The burritos found a new buddy in dancing heehe. Even though you are ornery sometimes, Daddy, Mommy, and Ate loves you very much. I hope that God will give you a healthy life and a bright future. You guys are invited to EJ's birthday celebration on Saturday. Wow,EJ has really grown from chubby into a slim boy. Happy b'day to EJ in an advance! talaga, happy birthday EJ.... you're gwapo na.. may girlfriend ka na? hehehe... thanks Rose for the drop. ginawa ko na kasi I'm wrapping up a lot of things at school kasi finals na namim.. nabuang nakog kadali.. hahah.. Happy Birthday to the lil man, Rose! How time flies. ang bilis talaga lumaki ng mga bata ngayon. ang cute naman talaga, look at the first pic, sarap balikan no. ang bilis lang ng panahon talaga.. maya lang binata na yan.. btw, i received your card sis, thanks so much. napaka thoughtful mo talaga. mwaaah! and I wonder if you received mine hihi, please don't blog it haha, me nobela ako don eh..
Advance Happy Birthday to your little guy. My goodness! He is sure getting big and turning 4. They sure grow up so fast. 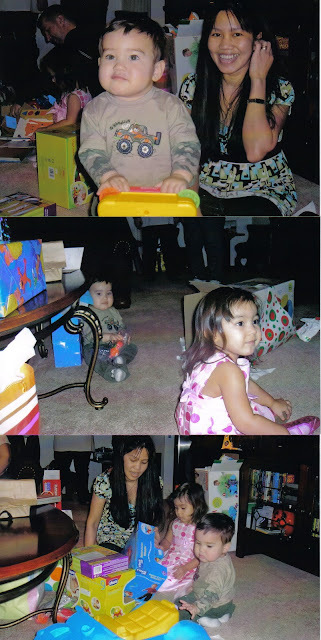 These are some precious photos, mommy Rose. Thanks for sharing! Hello everyone, we just got back from Pittsburgh.. I'll visit your entries shortly..
Ang bilis ng panahon Mommy Rose, parang ganyamnd in ang feeling ko ke AJ, anyways, advanced happy birthday kay EJ. 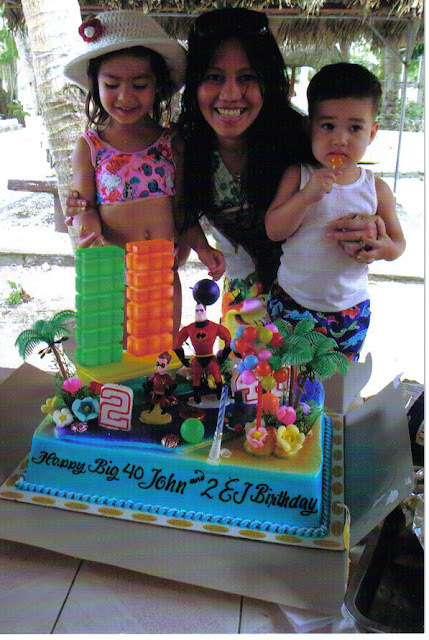 I wish him happy and healthy life..
awwwwww...ang daming gifts...bongga pa nang mga cakes....ehehee! advance happy birthday EJ...wish malapit lang kami...we will invite ourselves...nyahahaha! sensya po at huling huli sa pila...mwah! advance hapi bday ej! love the philippines celebration! Happy Birthday to your binata. Sige ha, punta kami sa Saturday. Hehe. birthday celebration is not complete without the cake. gusto ko yung pictures ng celebration nya sa Pinas. mukhang masaya. The birthday celebrations of EJ all through the years were milestones in his young life. The photos taken during those celebrations depict the closeness and bonding of the Cottrills all throughout those years. These are your strength as a family which nobody can take away from you all. Thanks for the memorable post. God bless you all always. These are lovely photos. Thanks for sharing them Mommy. Long time no see but trying to play again. Thanks!! !